The Galilean Telescopes sold on this site are not toys, but rather good working telescopes. The lenses are glass and are of significantly better quality that those used by Galileo. The kit are easy to construct and will introduce enthusiasts to the science of astronomy. NEW! Deluxe Galilean telescope kits now come with two eyepieces: the standard double concave (diverging) lens with a focal length of -75mm AND a 50mm focal length double convex lens. the double convex lens has many advantages. It has a much wider field of view and greater power, however, the image is inverted (upside down). Below are the instructions to assemble our telescope kit. If you can find the appropriate components you can build a telescope from these plans. However, it is likely that you will spend more to acquire the parts than the total cost of our kit plus shipping. In addition, drilling a smooth clean hole in the end cap of the tube is difficult. Use caution. In 1609 Galileo Galilei heard of new invention by a Dutch optical maker that magnified distant objects. Within months Galileo had crafted his first telescope and turned it toward the sky. His observations were profound, shaking the very foundation of science and religion. By March of 1610 Galileo had written a discourse on his initial observations, which was published as Sidereus Nuncius (The Starry Messenger) . Other publications soon followed with descriptions of mountains on the Moon, spots on the sun, bodies in orbit around Jupiter, the phases of Venus, and visions of stars where none appeared to the naked eye. Galileo, with this simple tool, transformed our understanding of the Universe. By the end of the 13 th century, craftsmen in Europe had developed magnifying glasses and had even mounted these lenses in frames to be worn on the face. In late 1608 Dutch spectacle makers mounted these lenses in combination and the telescope was invented. Galileo heard of this invention in 1609, and by the end of that year he had crafted several versions including the telescope that made the critical observations reported in Sidereus Nuncius. 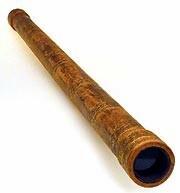 Galileo's original telescope had a 37mm diameter plano-convex objective lens with a focal length of 980mm. The original eyepiece was lost, but according to Galileo's writings was plano-concave with a diameter of about 22mm and a focal length of about 50 mm. These optical characteristics allow us to use a few simple formulas to calculate the powers of Galileo's telescope including the light gathering area, the light gathering power, the magnification of the telescope, and the focal ratio. Primarily for convenience the telescope contained in this kit has an objective lens of slightly larger diameter than Galileo's. The telescoping tube has an inside diameter of 2 inches, and a 50mm lens fits nicely. The objective is a double convex lens with a focal length of approximately 1000 mm. The ocular or eyepiece is a double concave (diverging) lens with a focal length of -75mm. The advantage of using a diverging lens for the eyepiece is that the image formed by the telescope is erect (right side up). Most modern telescopes use a converging lens for eyepieces making the image inverted (upside down). The Table below summarizes the characteristics of this telescope, which are quite similar to Galileo's first telescope. Note that this telescope gathers more light and therefore will see fainter objects than Galileo could. In addition, the magnification is slightly less and the field of view slightly greater allowing the telescope to be held easier without a rigid mount. The higher optical quality of modern lenses allows us to see detail that likely escaped Galileo. However, you will need to match Galileo's curiosity and power of observation. Important note: This kit is designed for assembly by people 16 years of age or older. Children under age 16 must be supervised by an adult. WARNING: DO NOT USE THIS TELESCOPE TO LOOK AT THE SUN! Do NOT look at or near the Sun. Immediate and irreversible eye damage will occur. Minors should have adult supervision at all times. 1. Telescoping cardboard tube with end cap and insert. a. The end cap has been drilled for use as the eyepiece holder (Figure 1A). b. The inner tube (Figure 1B) will slide into the telescope tube Figure 1C and serve as the focusing mechanism. 2. 50 mm objective lens, double convex, 1000 mm focal length. 3. 50 mm eyepiece, double concave, -75 mm focal length. 4. Warning sticker; this must be affixed to the telescope upon completion and prior to any observing. a. The end cap has been drilled for use as the eyepiece holder (Figure 2B). b. The inner tube (Figure 2E), which will slide into the telescope tube (Figure 2F) and serve as the focusing mechanism, has been cut to provide for the objective lens retainer. 1. White glue (We recommend white glue, however, other glue will work). Children should have adult supervision when adhesives are used. Cutting the Tube (Basic version only. If you purchased the Deluxe pre-cut version skip to section 2). 1. Remove the end cap and pull the focusing tube from the telescope tube. 2. Cut the telescope tube 6 inches from the metal end. This will become the dust cover for the telescope. Make the cut perpendicular to the length of the tube. A band saw works great. A hobby saw or copping saw will work well too. Make the cut as straight as possible; a miter box is a great help. Children should have adult supervision with saws. 3. 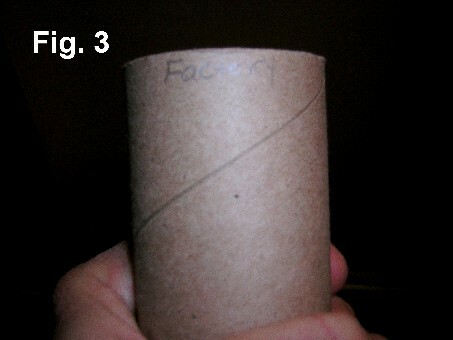 Using a pencil, place a mark at the end of the focusing tube (inner tube) to identify the factory-cut end (Figure 3). Using a tape measure or ruler and a pencil, mark the focusing tube (inner tube) 3 inches and 9 inches from the end where you made your 1st mark. Cut these two sections from the focusing tube along the pencil marks you just made; they will be 3 inches and 6 inches long. These will become the objective lens retainers. 4. Cut an additional 2 inches from the inner (focusing) tube and discard. This step is necessary to size the focuser to the focal length of the objective lens. 1. 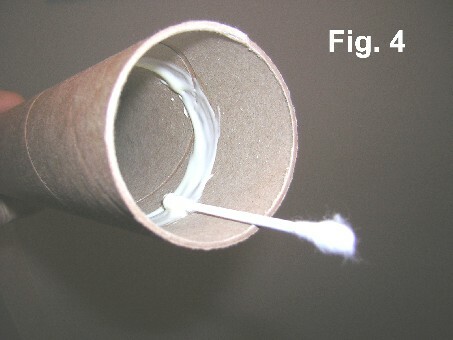 Run a bead of white glue inside the telescope tube at least 1 inch in from one end (Figure 4.). You may want to smooth out the bead of glue with a cotton swab. IMPORTANT: Keep the glue at least 1 inch from the end of the telescope tube. 2. Now slide the 3 inch lens retainer into the telescope tube until the end of the retainer is ¾ inch from the end of the tube (Figure 5). IMPORTANT: BE SURE THAT THE FACTORY-CUT END OF THE 3-INCH RETAINER IS TOWARD THE END OF THE TELESCOPE TUBE ON WHICH YOU ARE WORKING. THIS WILL BE THE LENS RETAINER, AND THE FACTORY CUT MAY HAVE A STRAIGHTER CUT THAT YOURS. 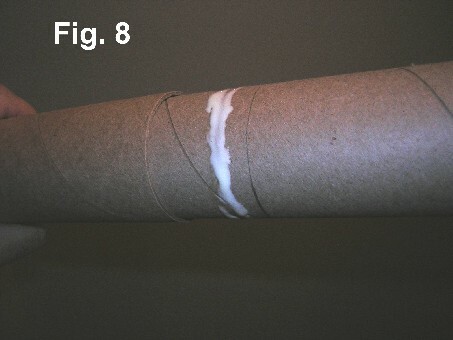 You should not be able to see any glue between the retainer and the end of the telescope tube. If there is some glue in this area, wipe it with a cloth. Allow the glue dry. 3. 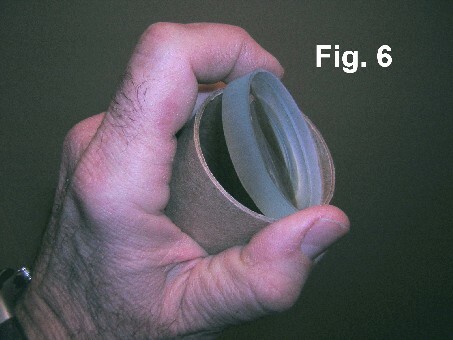 Insert the objective lens (Double Convex, 50 mm diameter, 100 cm (1000 mm) focal length) into the end of the tube until it rests against the retainer (Figure 5). 4. Apply white glue to the outer side of the remaining 6-inch-long lens retainer about ¼ inch from one end. You may want to smooth out the bead of glue with a cotton swab. 5. Insert the long lens retainer into the end of the telescope tube until it rests against the objective lens. Twist the retainer about ¼ turn to smooth the glue and strengthen the bond between the retainer and the telescope tube. Wipe off any excess glue and allow the glue to dry. 6. After the glue is dry, place the dust cover over the outer objective lens retainer. 7. Insert the eyepiece lens (double concave, 50 m diameter, 7.5 cm (75 mm) focal length) into the eyepiece holder (the one with the hole in the metal end) until it rests against the metal end with the hole (Figure 6). 8. Insert the focusing tube (without glue) into the eyepiece holder until it rests against the eyepiece lens. 9. 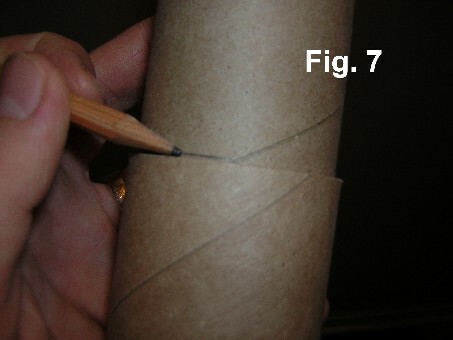 Using a pencil, make a mark around the focusing tube at the end of the eyepiece holder (Figure 7). 10. Now withdraw the focusing tube about 1 inch and run a bead of glue around the focusing tube between the pencil mark and the end of the eyepiece holder. Smooth the bead of glue with a cotton swab (Figure 8). 11. Slide the focusing tube into the eyepiece holder until it rests against the eyepiece lens. Twist the focusing tube about ¼ turn to smooth the glue and strengthen the bond between the focusing tube and the eyepiece holder. Wipe off any excess glue and allow the glue to dry. 12. Assemble the telescope by sliding the focusing tube into the telescope tube. 13. AFFIX THE SUN WARNING STICKER! Press the sticker on tightly. Secure with clear tape if necessary. The Sun warning sticker MUST be displayed on the telescope. Your Galilean telescope is ready for use. To focus just point your telescope at an object and slowly slide the focusing tube in and out of the telescope tube to focus. If you want the focusing tube to fit more snugly in the telescope tube, wrap a couple of strips of masking tape around the focusing tube near its inner end. The field of view is relatively small, so the object you are looking at will appear to shake. You can steady your telescope by leaning against a wall, fence, or other stationary object. Start your observing session on a bright object such as the Moon. Focus your telescope on objects such as craters. Switch to another object. The planets Venus, Mars, Jupiter and Saturn will make excellent targets. Large diffuse objects, such as the Great Nebula in Orion or the Andromeda Galaxy will also be easy targets for your telescope. One of the great difficulties in amateur astronomy is finding objects in the night sky. However, many resources are available on the internet, and planispheres and star charts are available at many hobby stores. Anyone interested in astronomy should pick up a copy of Sky and Telescope or Astronomy magazine. They have star charts for the current month and articles describing what to see in the current night sky. In addition, for those new to amateur astronomy we suggest keeping an observation log or record book. Start your log by recording the date and time, weather conditions, and phase of the moon. As you begin to observe record the "seeing" conditions. Seeing is the clarity and stability of the atmosphere as it affects ability to observe celestial objects. Even though the sky may appear clear, humidity, haze, pollution, and atmospheric turbulence can prevent you from seeing many objects. There are several different scales that are used to describe the seeing. Sky and Telescope magazine's website describes the Pickering Scale, a common scale ranging from 1 (poor seeing) to 10 (perfectly clear) and it can be found at http://skyandtelescope.com/howto/scopes/article_569_1.asp. The scale we prefer is a 5-point scale ranging from 1 (poor) to 5 (excellent). Both scales are described with graphical representations at the website of the Royal Astronomical Society of Canada, which can be found at http://calgary.rasc.ca/seeing.htm. You may want to devise a rigid mount for your telescope. An easy way to steady the view is to fasten the telescope to a camera tripod. One way is to tape the telescope to the tripod head. If you use tape to hold the telescope, we STRONGLY suggest that you cover the telescope tube with plastic wrap or a cloth and fasten the tape to that cover. In this way the tape can be easily removed without marring the telescope tube. Finally, as you observe new objects make sketches of what you see. Galileo recorded his observations in this manner. You can see his sketches in Sidereus Nuncius. Lastly, be sure to observe on consecutive nights. Many things change rapidly such as the position of the moons of Jupiter and the phases of the moon. To learn more about amateur astronomy or the life of Galileo, please visit our website for information and links to a multitude of internet resources. A simple mounting bracket can be constructed from a small block of wood. 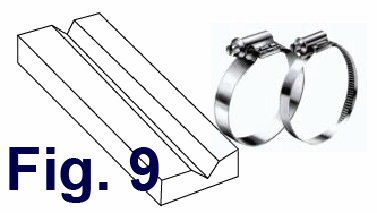 Cut a v-notch in one side and secure the block to the telescope tube with two hose clamps of appropriate size (Figure 9). More elaborate mounts can be constructed if you use a little imagination. Galileo's telescope was covered with red leather. You can cover your telescope with cloth, paper, or even leather. Alternatively you could spray it with a colored or textured paint. The exact procedure will depend on what you would like to do, however, here are some basic steps for covering. 1. You will need: cloth, paper, or leather to cover the telescope, spray adhesive (Elmer's Spray Adhesive (No. E-451) works well, but there are many other spray adhesives on the market), scissors or hobby knife, damp cloth for clean-up (NOTE: Children MUST be supervised by an adult when using scissors or hobby knife). 2. Lay out your telescope and obtain the appropriate material for the cover. 3. Use an extra piece of the covering and experiment with a paper roll from kitchen paper or from wrapping paper. 4. Evenly coat the tube with spray adhesive following the directions from the manufacturer. DO NOT GET ADHESIVE ON THE LENSES OF THE TELESCOPE! 5. 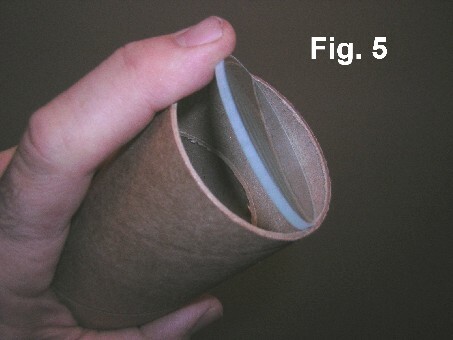 Carefully roll the paper onto the tube and allow to dry. Thanks for visiting our website. Screw up? Ruin your tube? Glue on a lens?